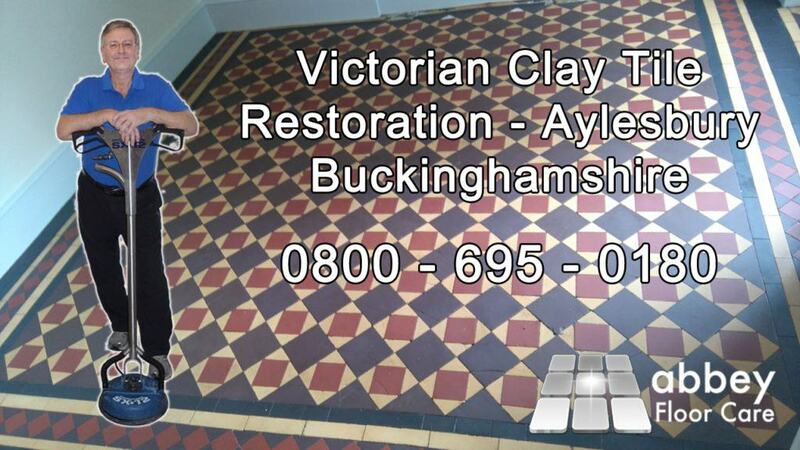 We are undertaking tile restoration of a vitorian minton style clay tile floor. 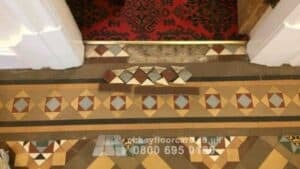 The floor is over 100 years and it has had a number of different coatings over its lifetime. In the past the floor has been sealed and had adhesive applied for glue down carpet. The surface of the tiles has ingrained soil, which is not surprising owing to its age. Over half of the tiles are loose as a result of a loss of the original grout and breakdown of the original adhesive. 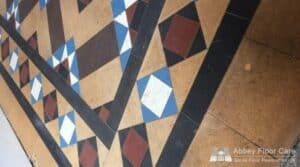 Re-grouting was not in the restoration specification, however the condition of the tiles meant that we had to take great care not to over-wet the floor and not to dislodge any of the tiles during cleaning and drying. First we installed protective plastic sheeting to the walls and adjoining rooms. We also removed the door to the w/c to make access easier. The first job was to remove the various surface coatings. 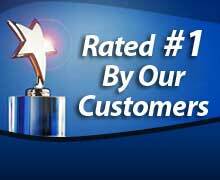 We used a broad spectrum gel based sealing and coating remover. The coating was allowed to sit on the floor for a couple of hours to penetrate the coatings and adhesives. The coating remover does not dissolve coatings, it actually penetrates the coating, softening it and preparing it for removal. The removal process started with rotary cleaning equipment with various grades of cleaning pads and brushes. The floor was then carefully rinsed to remove the slurrey and residues. As the floor was old and well worn, quite a lot of the tiles had worn and the old coatings could not be removed with machinery. We applied more sealing and coating remover to these areas and left them to soften the remaining coatings. We then used hand pads and brushes to reach and remove the final coating residues. The floor was then carefully rinsed and dried a couple of times to remove all traces of old coatings and sealers. We then left the floor overnight to dry out ready for sealing. As you can see old clay tiles loose the depth of colour when they are cleaned because the hard pouter layer has worn away. We brougt the colour and vibrancy back to the floor by applying two coats of our specialist colour enhancing penetrating impregnating sealer. As you can see the colour transformation is significant. 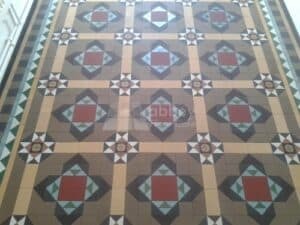 The different colour tiles stand out giving a beautiful appearance. We carefully explained the importance of looking after the floor properly. It is important to use the right cleaning chemicals as standard floor cleaning chemicals will eventually strip away the impregnating sealers, leaving the floor dull and porous. The correct cleaners will clean the and extend the life of the surface finish. So the floor will continue to look beautiful for years to come. 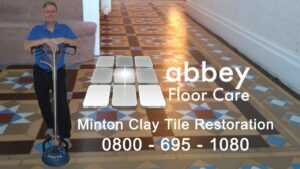 If you would like your victorian clay tile floor or any other kind of stone floor restoring to a beautiful finish call Abbey on 0800 695 0180 or complete our simple contact form.